Our Funarena! : Tendulkar Farewell Test Series: Rohit Debut Ton Rescues And Puts India Ahead!! Tendulkar Farewell Test Series: Rohit Debut Ton Rescues And Puts India Ahead!! The fans in Kolkata just about managed to have everything they wanted of their idol. They saw him jumping and running around the field, enjoyed him bowling and reveled as he took a wicket too on the first day of the first cricket Test between India and West Indies. On the second day today they wanted to see him bat early and therefore even cheered the fall of the first two wickets. Sachin Tendulkar came in to bat within the first hour of today’s play and he seemed to be in a good nick hitting two beautiful boundaries. But this wish of the fans to see him have a long innings was cut short by 'Llong'--umpire Nigel Llong to be exact--who ruled him out leg before even as the ball that hit his back thigh seemed to be going above the off stump. Problem is off spinner Shillingford—the wicket Tendulkar captured yesterday—actually beat the retiring legend and the best batsman of the world has in fact been beaten around his leg consistently over the last one year. Apart from the focus of the Series cricket in the first two sessions was abysmally poor with the Indian top order caving in meekly basically to the spin of Shillingford who took four huge wickets. Reverse swing and some amount of turn were visible on the pitch right from the morning today with the ball keeping low most often run making was difficult. Combining his skills of having an unpredictable bounce and a perfectly disguised doosra Shillingford troubled all the batsmen reducing India to 83 for 5. It could have been worse if a catch of Dhoni was taken at that stage. 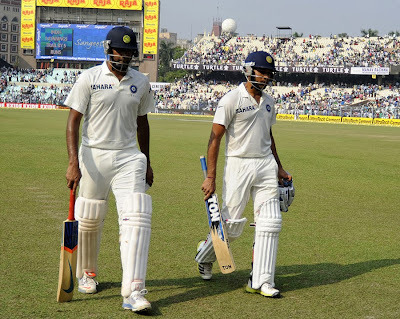 Debutante Rohit Sharma then took full charge and with his captain laid the anchors for a much needed partnership. At lunch the score was 120/5. However soon after lunch Dhoni fell to Best for 42 at India 156/6 and it was still an uphill task with not even a half century till then by anyone. Fresh from his double ton in the final ODI against Australia and inspired by the Test cap achieved after nearly three-year-long wait Rohit got to the first fifty of the innings and with able company provided by R Ashwin rescued India to 229/6 at tea. The second session was the better as nearly hundred runs were added with the loss of just Dhoni.